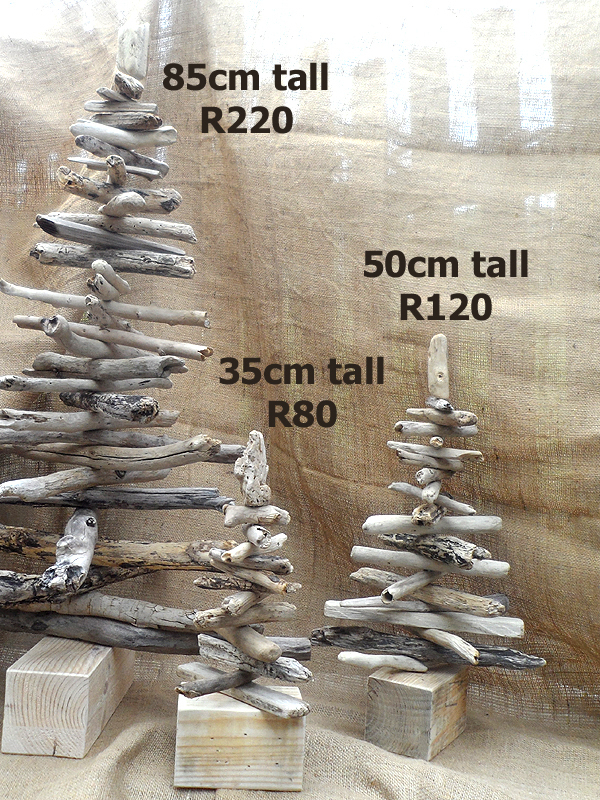 If you are looking for small hanging driftwood Christmas trees for sale in South Africa, you’re at the right place! We make and sell small hanging driftwood Christmas trees in 3 different sizes. Hanging driftwood Christmas trees South Africa – the photo on the right is of the same three trees, but with sea shells (with holes in them) threaded onto the sisal loop at the top. Or contact us about ordering our standing driftwood Christmas trees for sale in South Africa – see the photo below of three driftwood Christmas trees that we have made. Postage and packaging is via Postnet to Postnet in South Africa, and won’t cost less than R99 for the postage and R30 for the packaging, but postage and packaging can only be properly priced once we know what your exact order is, so that we can determine measurements and weight of the parcel. – items such as: sea shells (with a hole in them), pebbles with holes in them, wooden beads, a small traditional Christmas tree decoration, some metal bottle caps with a hole drilled in the middle of them, or a small decoration you make yourself. You may simply want to tie a bow at the top using ribbon or something else pretty. The two lengths of sisal hanging at the bottom of the hanging driftwood Christmas tree can also be decorated – thread on wooden beads, glass beads, sea shells, tiny homemade Christmas tree ornaments, or other decorative items. You can adjust the driftwood pieces of each tree to have the pieces all aligned (this looks good if the little tree is hanging right against a wall or wooden background rather than just in mid-air), or you can position the driftwood pieces so that they are at right angles to each other, or position the pieces in any way you like. The driftwood pieces are removable so you could take them off and then put them back on: a bead (or something else), a driftwood piece, a bead, a driftwood piece, a bead, etc etc – if struggling to get the sisal back through the hole in the centre of each driftwood piece, use a piece of wire bent double to help you thread the sisal through the holes again. Leave your driftwood trees plain, or paint and decorate as you please. and then sell individually to make a profit! Use our small hanging driftwood Christmas trees at a beach themed or rustic themed wedding in South Africa even if it’s not a December wedding – use as decor or use small ones as wedding favours – attach a “thank you for sharing our special day with us” small card to the top or bottom of them. General Tip: Do not wait too long before ordering any Christmas items from anyone! You might also consider simply ordering several driftwood pieces of different lengths and making your own small hanging driftwood Christmas trees or making table top driftwood Christmas trees with them – or use the pieces in other driftwood Christmas craft projects or decor idea projects, or for beach theme ideas. We collect 5 to 10cm, 10 to 20cm, 20 to 30cm, 30 to 45cm, 45 to 60cm, and 60 to 80cm driftwood pieces at the beach in South Africa. See our driftwood pieces discounts and prices page.